I used to be such a great fan of Jewel Bako, tremendous fan. But very sad to say, after this latest experience, I will NOT be visiting again. 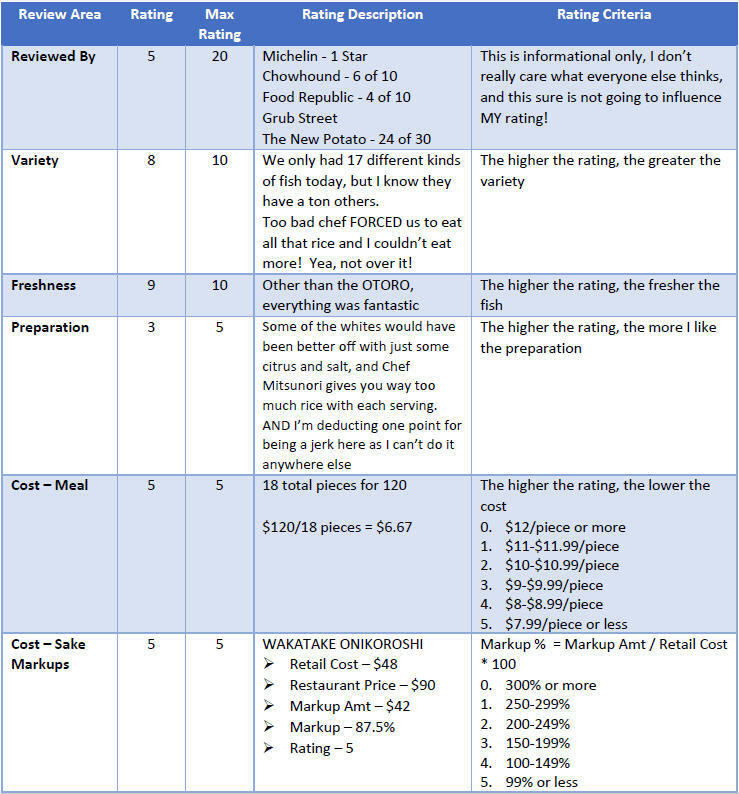 Not for a very long time, not unless there are some major changes (with the Chef). A long, long, looong time ago, good chefs got away with murder when it came to their bad behavior. This was because 10, 15 years back, we only had a handful of quality sushi-yas. So for great sushi, customers sucked it up and dealt. These days, there are enough great sushi options out there, that customers no-longer need to put up with it, we can say NO! It’s really sad though. 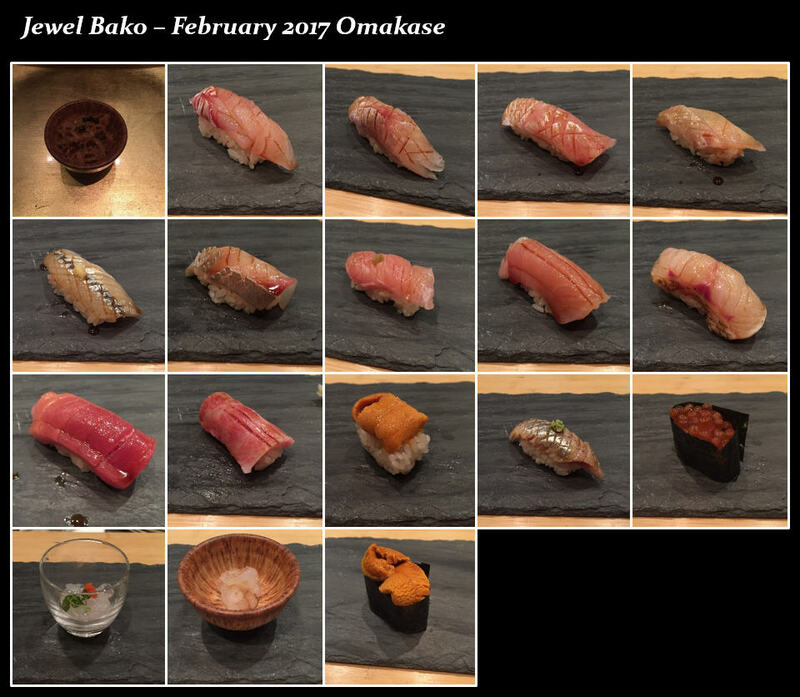 Just six months prior, in our August 2016 visit, Chef Shimao Ishikawa was the reigning head chef. One of the most knowledgeable, personable, kind chefs there are. Today, it’s Chef Mitsunori Isoda. Ruler with the iron fist! Admittedly, I have my quirks when it comes to sushi. I have an incredibly sensitive nose, so I cannot have wasabi. I prefer sushi over sashimi, but want very little rice. Ideal is half size, but if they can provide 2/3, I’m happy enough. And everything else, I’m pretty open. 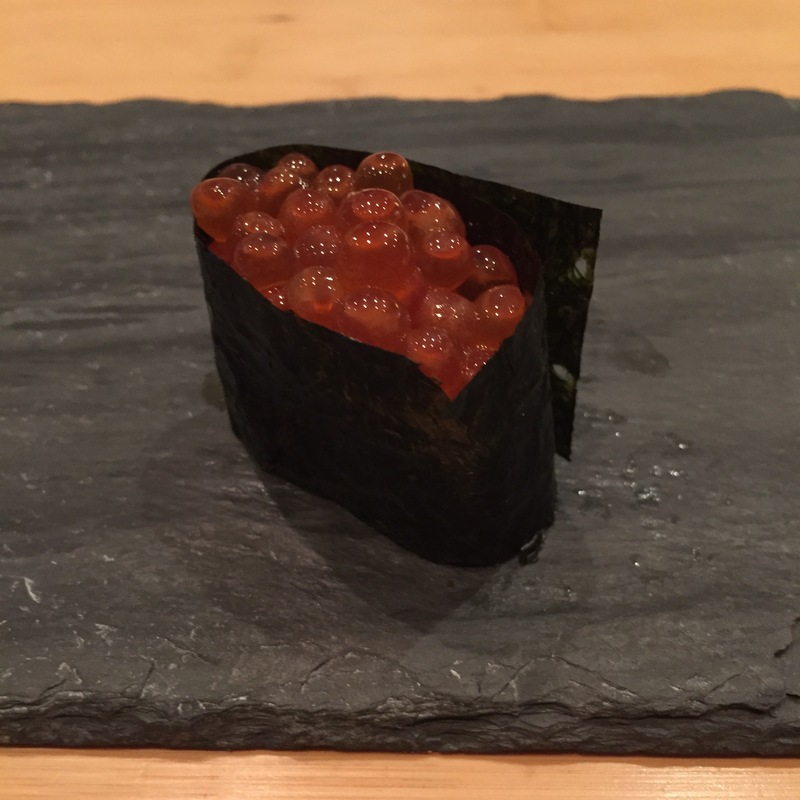 Well chef Mitsunori spared no time in setting expectations with me. He almost immediately shared, “I care if you have allergies, but other than that, I don’t care”. His English was not great, but that line came out so fluidly. He clearly has said that line once or twice, or a million times before! After my few servings, I asked him again, “I want to try as much of your food as possible, but I have a small stomach, so if I can please give me less rice?” He MIGHT have given me 2 less kernels per serving, meaning no change. So after a couple more pieces, I went rogue and decided to just leave some rice on my plate. Boy did he not like that! 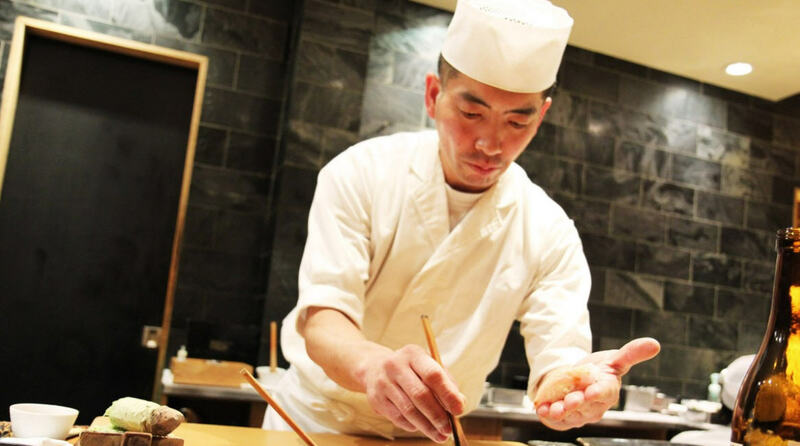 He tells me, “If you want sashimi, I make you sashimi, if you want sushi, you eat what I make. Or you can sit at a table, not at my bar.” I was shocked, astounded, dumbfounded! How does one respond to that? Well, I tucked my tail between my legs, and pretended to eat all of Chef Mitsunori’s rice, while sticking half of it in my napkin. Yea, I pulled an Elaine from Seinfeld. Clearly, this was a losing battle, so if that’s the only way we can eat in peace, I’ll deal. He also did not like the fact that I was taking time to take photos before consuming. He scolds me with “Eat now!” He later tells me “I’m not mean, but my sushi is meant to be eaten right away.” Come on! That 10 seconds spoiled the sushi? Really? It became very clear, if I took anything more than 5 seconds taking that photo, my next serving will definitively have a wasabi. It was Chef Mitsunori’s way of punishing me. Bamboo shoots with sanshu peppers and sesame seeds – this was good. Chef Shimao gave us Conch, now we get a vegan dish. Which would you prefer? 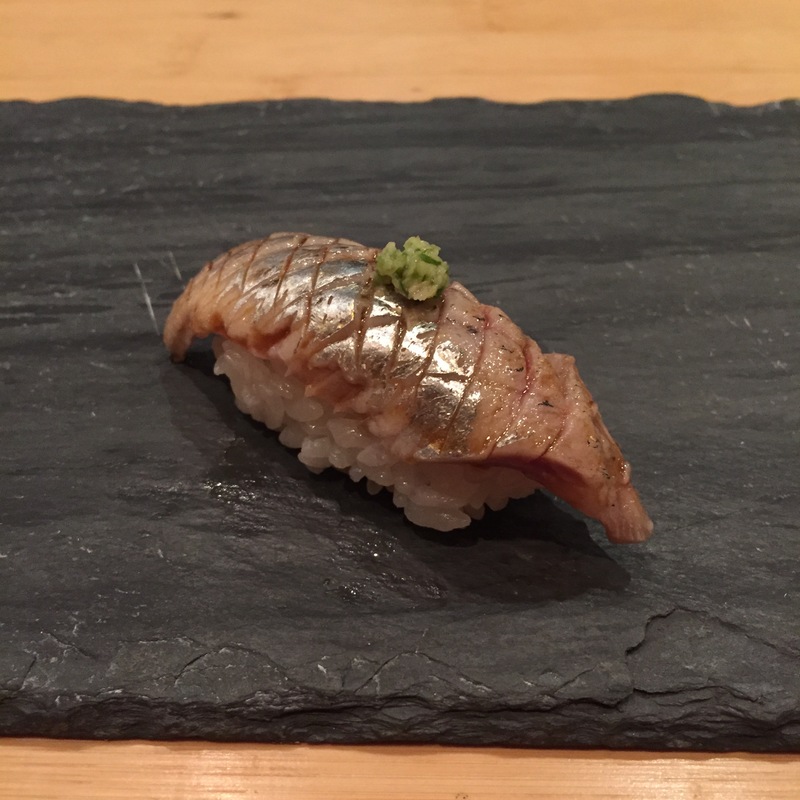 ITO URIKA (Golden Red-Fin Snapper) – I don’t believe I’ve ever had this before. 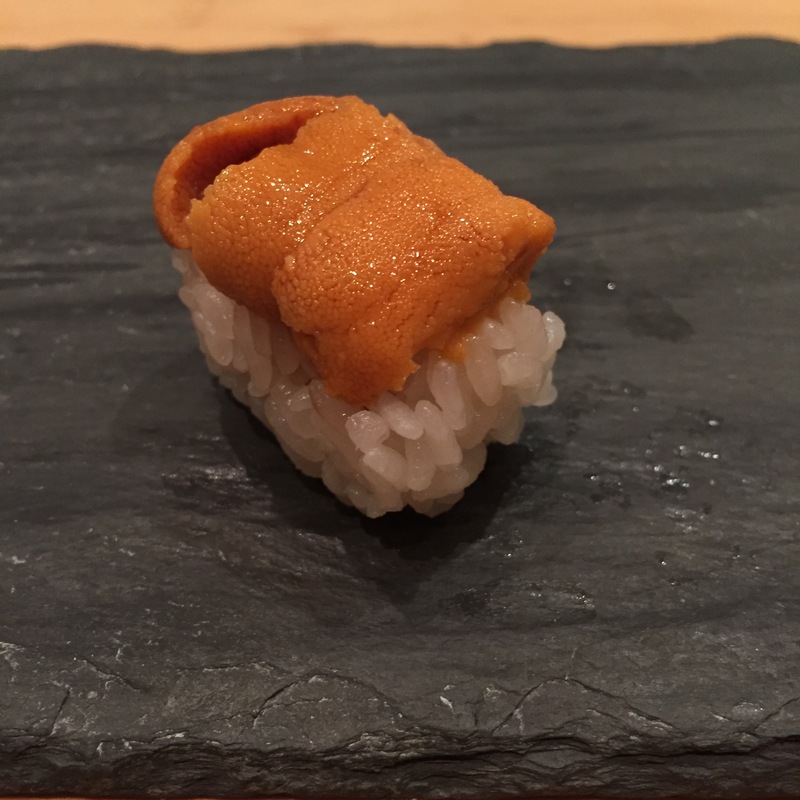 Chef says this was popular in Japan, but less so in the states. Both tender and mild, not at all chewy. 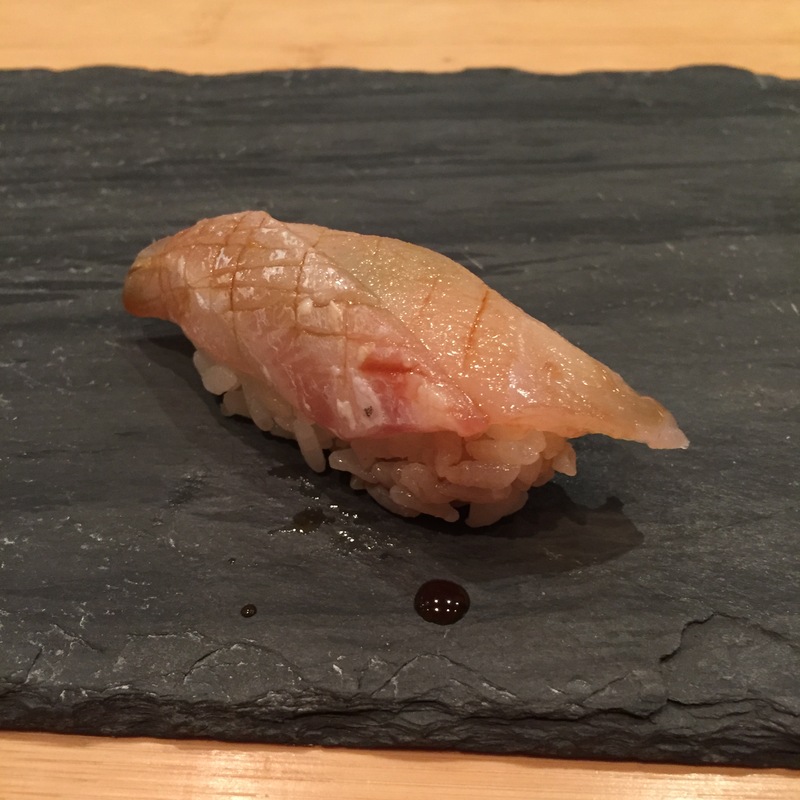 KAMASU (Barracuda) – Really not used to it served this way, where almost all the skin has been removed, so zero smokiness. 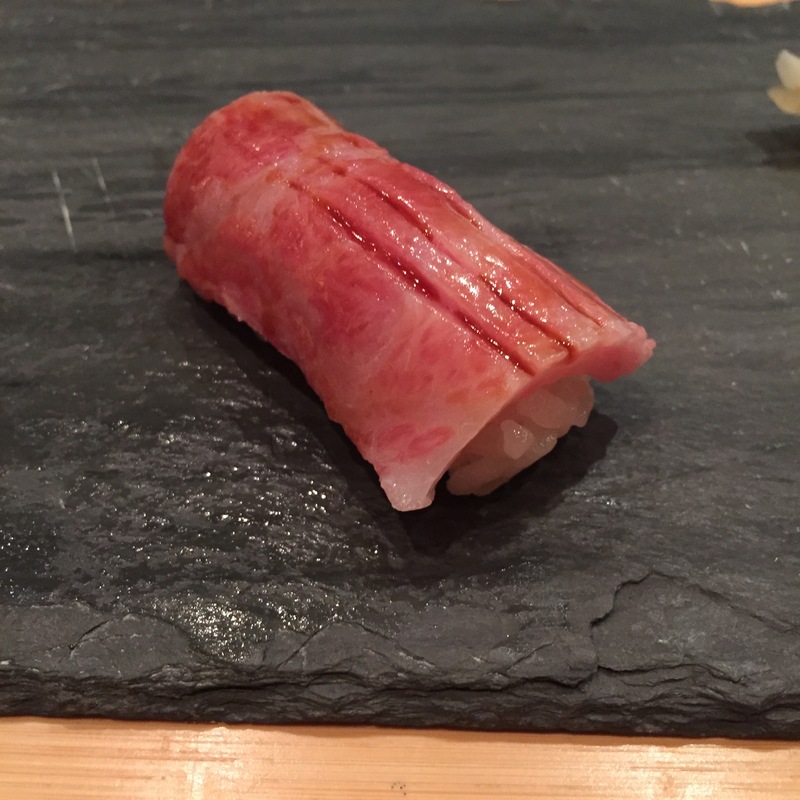 It was incredibly mild, and still very good, but 100% not recognizable as a KAMASU. 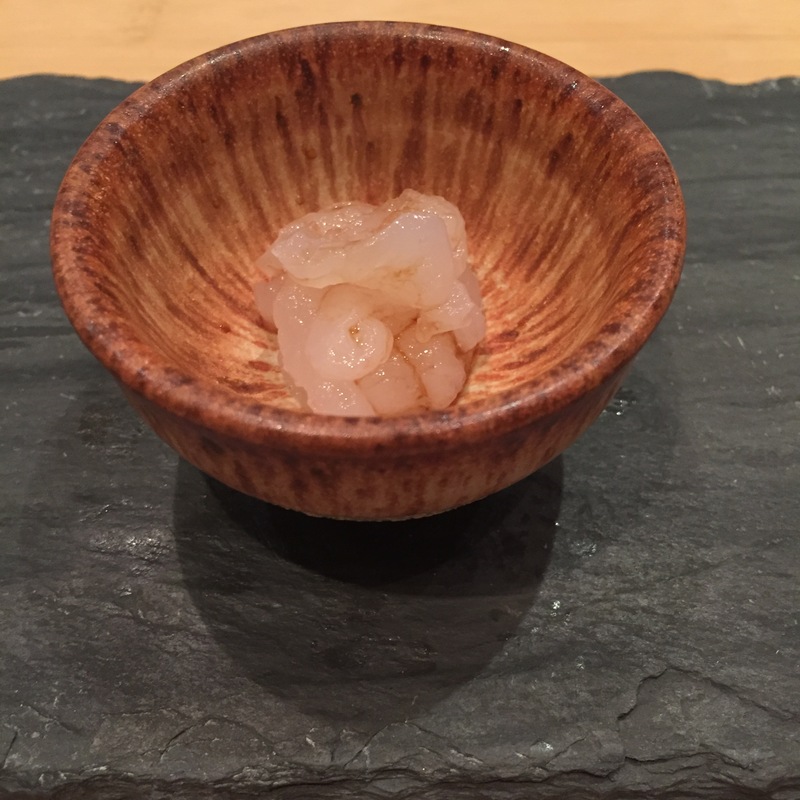 HIRA SIZU (the winter version of a SUZUKI – sea bass) – I really, really love SUZUKIs. 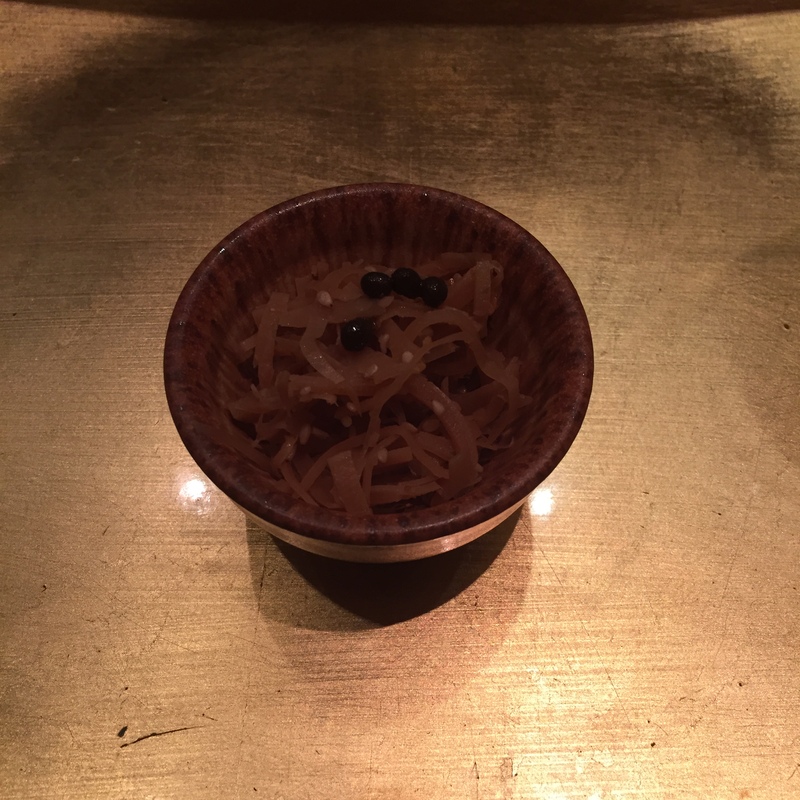 Chef said this was a HIRA SIZU, but I can’t tell the difference. 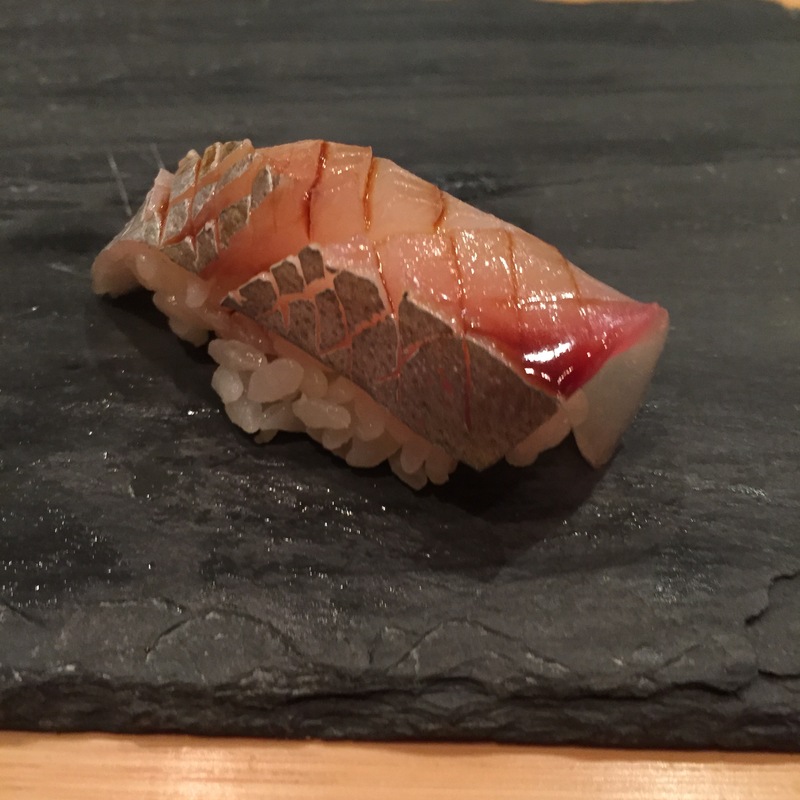 SAYORI (Needle fish) – Really light, beautiful crunch, fantastic fish. 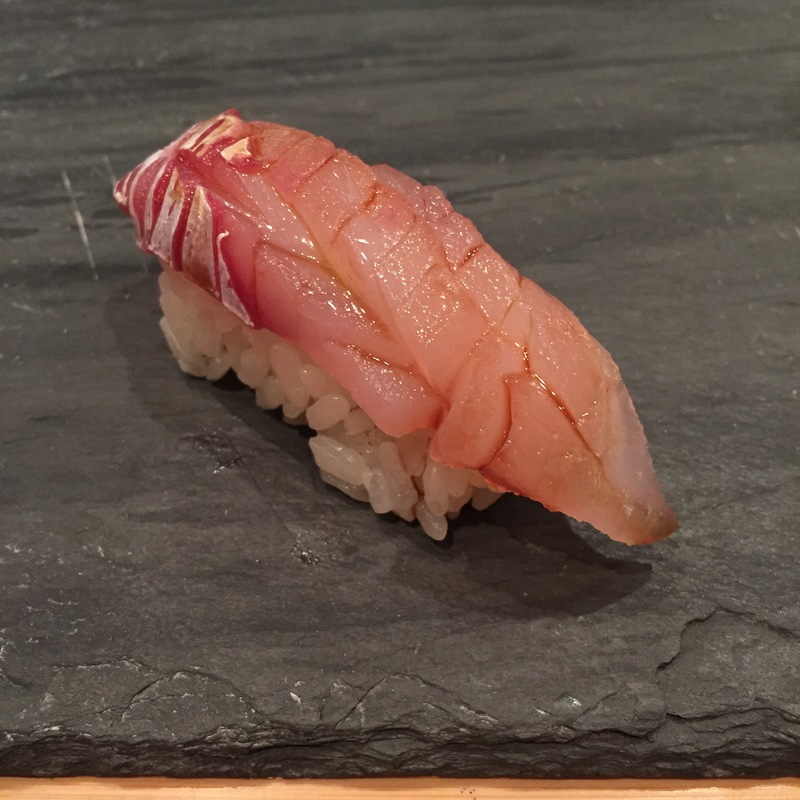 JA KIM (KINMEDAI – golden eye snapper from a specific location in Japan) – The fish itself was fantastic, I love KINMEDAIs. 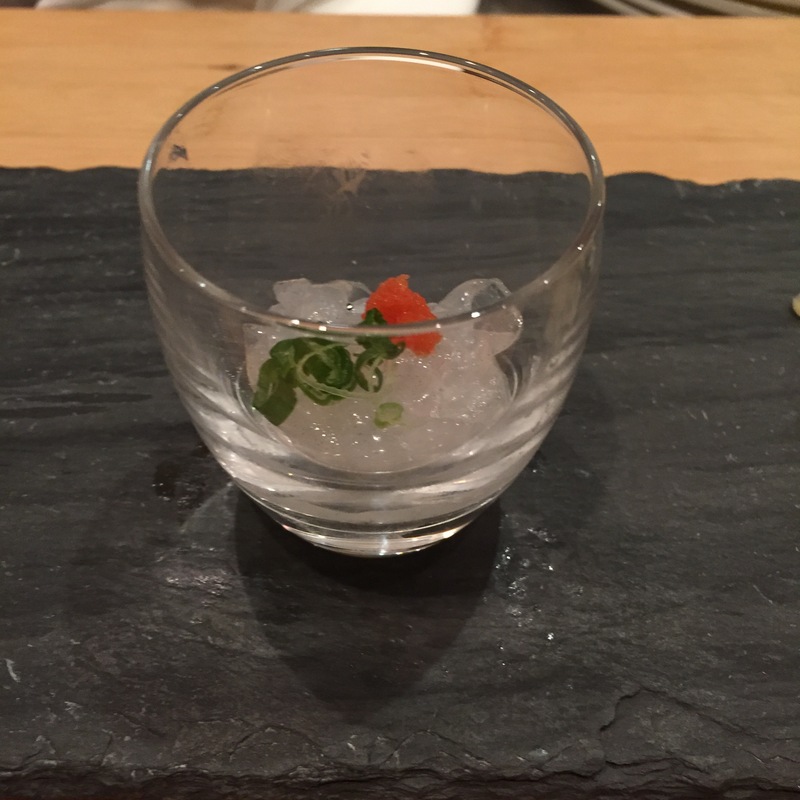 But serving it with the yuzu pepper was a mistake. Overpowers the fish. 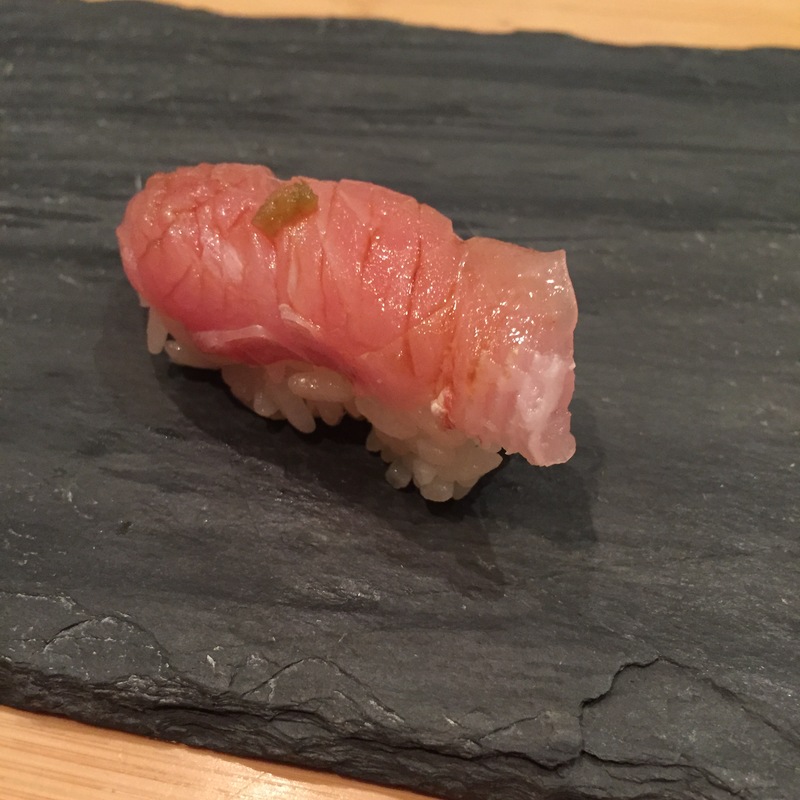 CHUTORO (Medium Fatty Tuna) – Very good, my favorite cut of TORO, nice and fatty, but not too fatty. 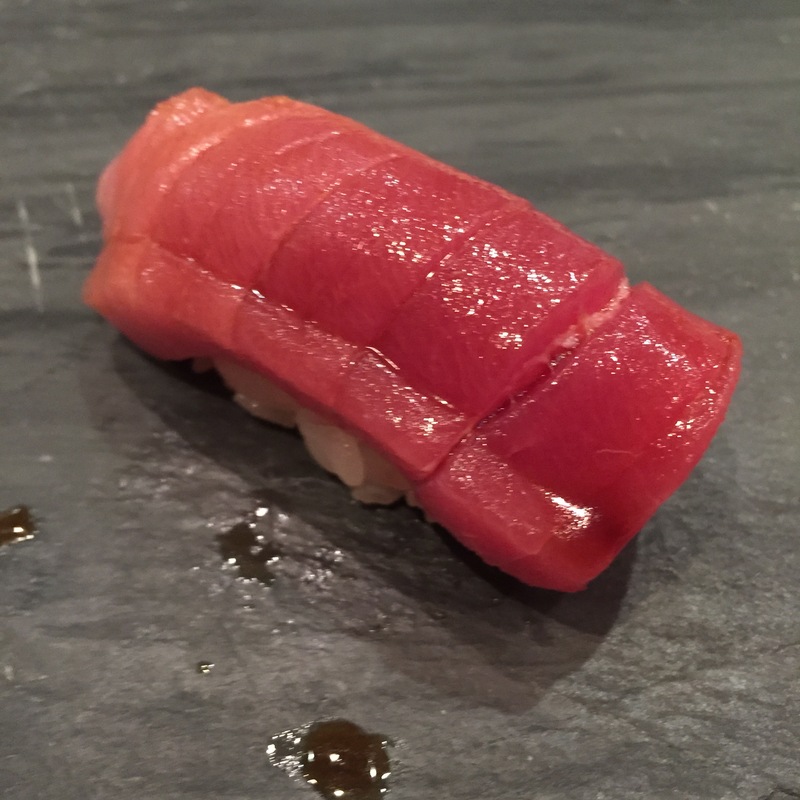 OTORO (Super Fatty Tuna) – This was not as good. 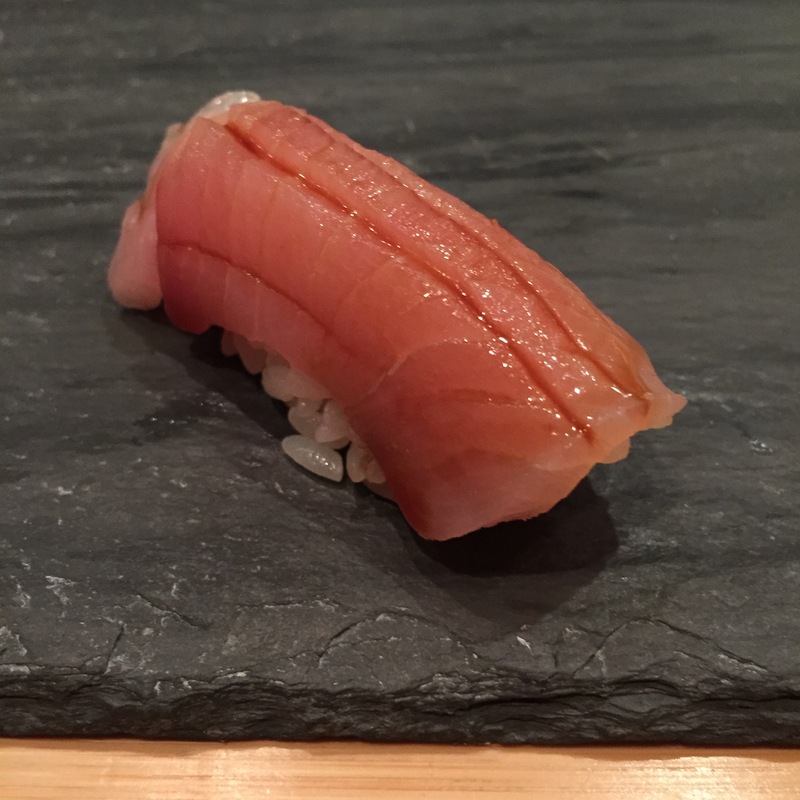 Sometimes you get a lower quality otoro, where the fat is distributed so poorly that there’s a film of oil wrapping the fish. After consuming, your mouth is left with a nasty layer of grease, and it’s not pleasant. 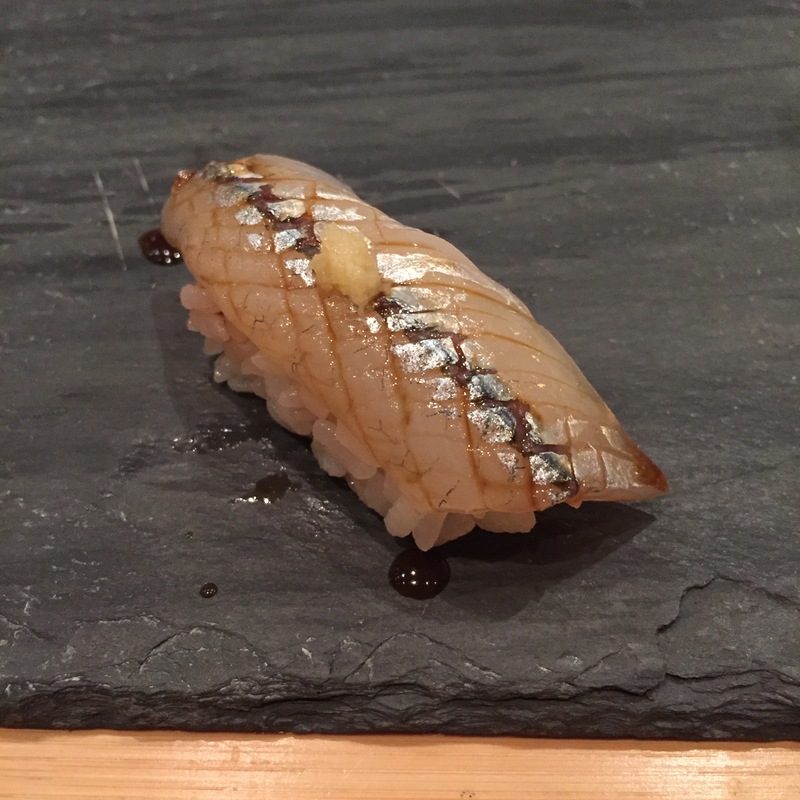 IWASHI (Japanese sardine) – I LOVE IWASHI. 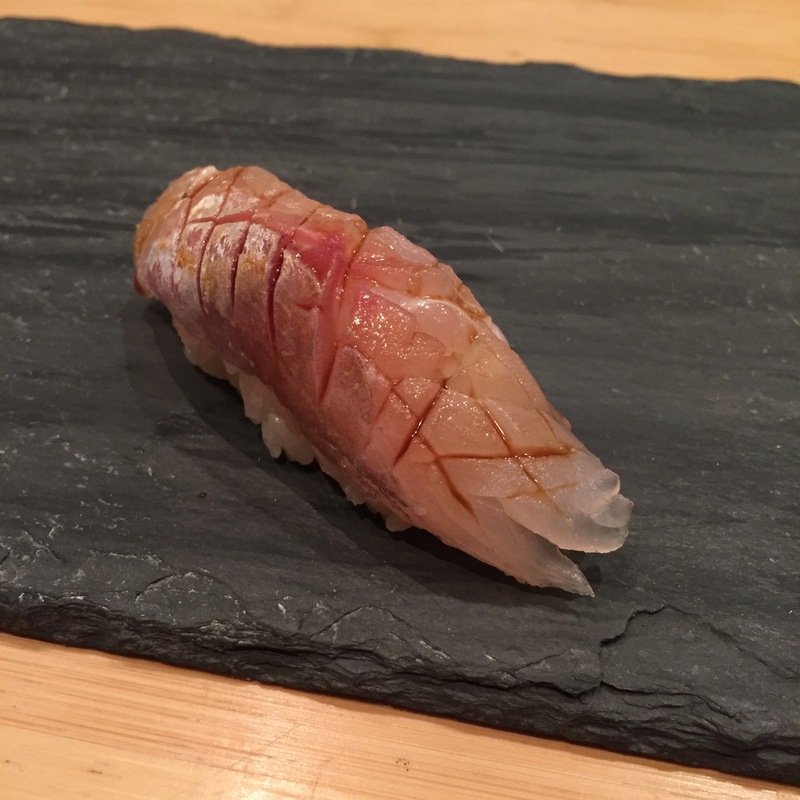 After our latest trip to Uogashi, where we watched the chef blunder the skinning, I have an even greater appreciation for preparing the IWASHI. This w as fantastic. 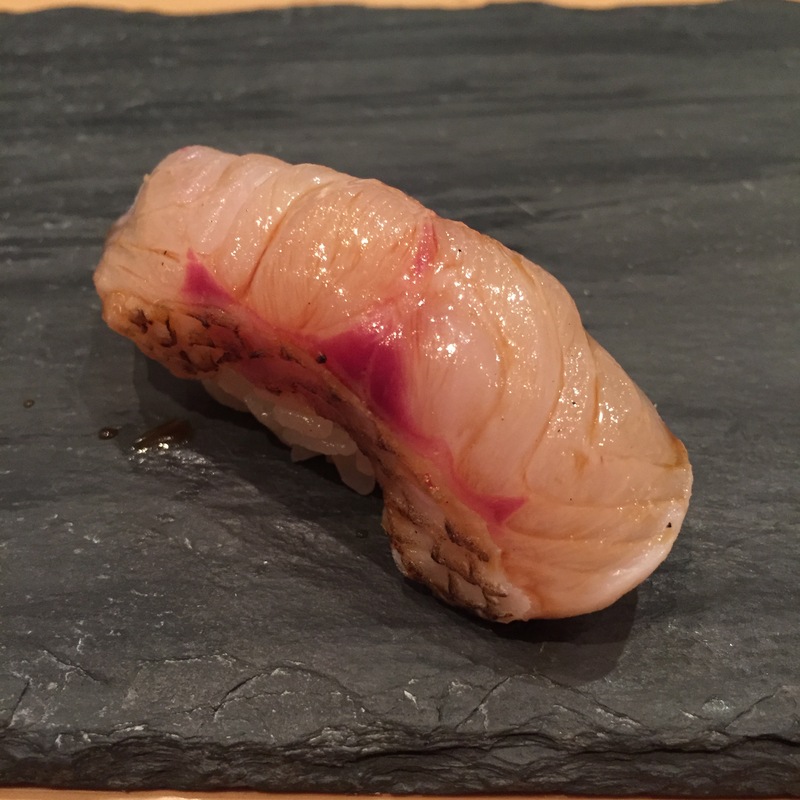 NORESORE (young conger sea eels) – NORESOREs have an extremely short season, it’s really only avail February/March, but it is SO delicious when they have it. It’s the only eel I enjoy! 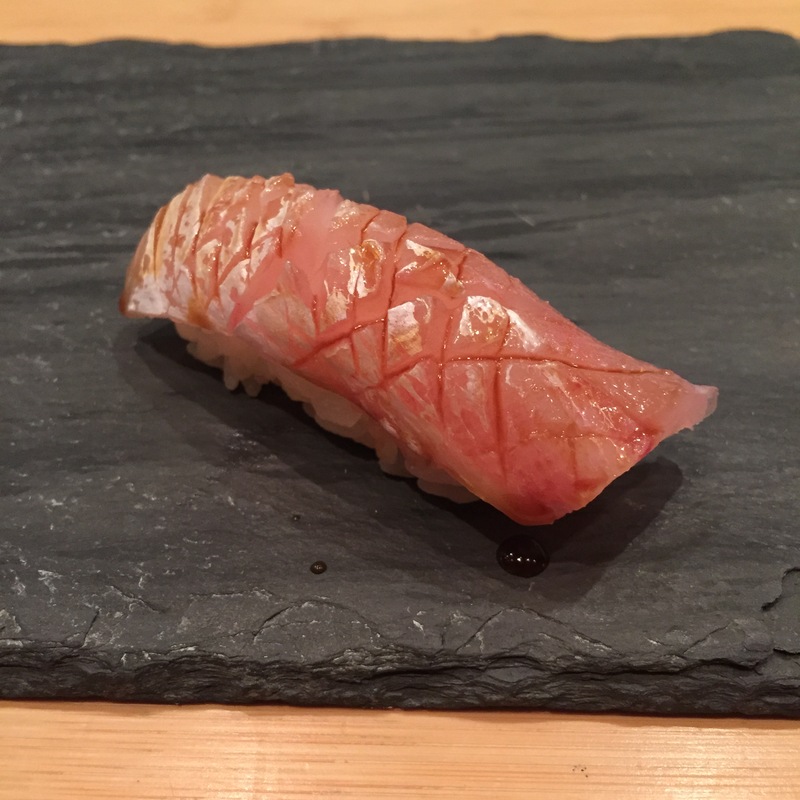 SHIRA EBI (Baby white shrimps) – Another beautiful winter fish. This is why I hate when chefs are a-holes. I really do enjoy their food here, they have great variety, and even the harder to find fishes. It’s just not worth the frustration. 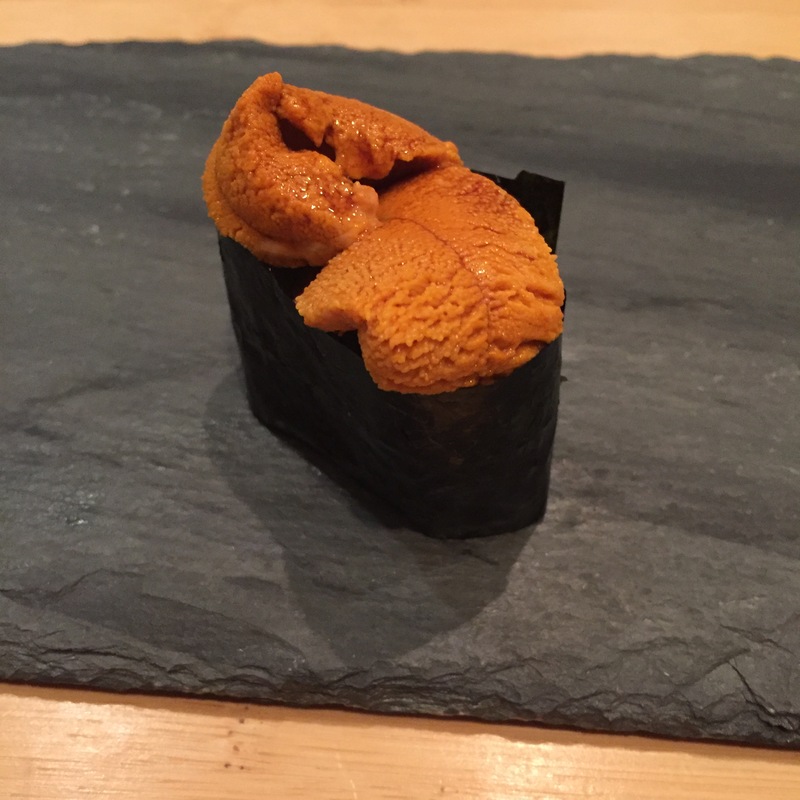 SANTA BARBARA UNI – Very yummy!